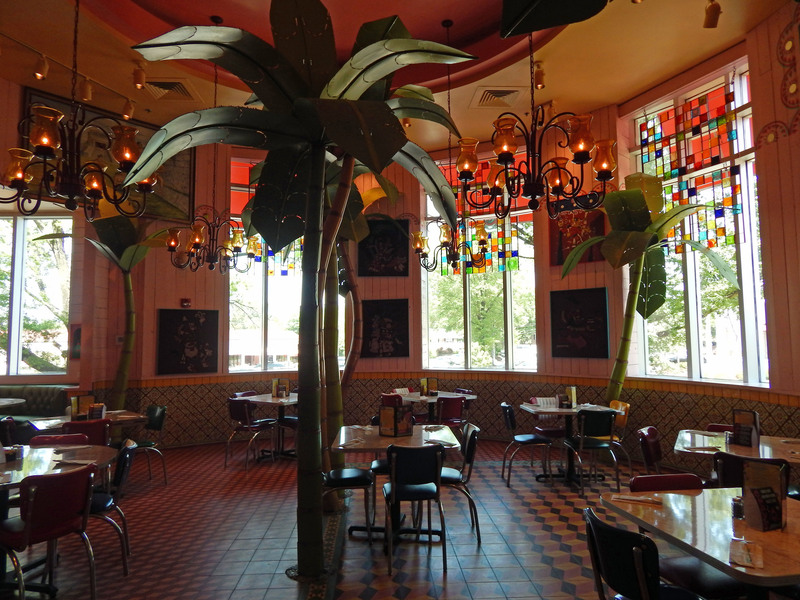 Chuy’s is a fun, kitschy Tex-Mexican restaurant located on the outskirts of SouthPark Mall (in the space formerly occupied by M5). It’s a restaurant Charlotte vegans should know about. 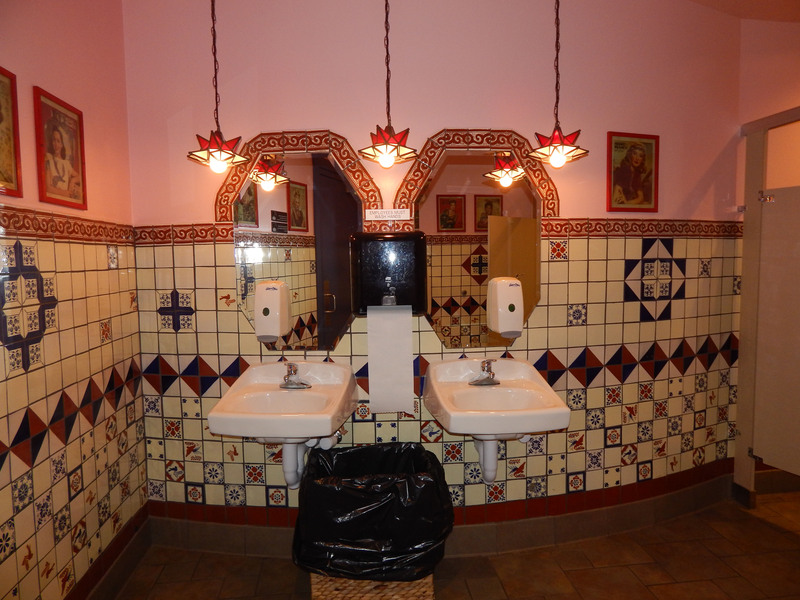 Chuy’s is completely transparent. Everything is exactly as it seems to be and there are no nasty, “secret” ingredients. Beans are beans, without hidden pork. Rice is rice, without added chicken stock. Tortillas are tortillas, made fresh in-house daily, without lard. Chuy’s even has a separate vegetarian/vegan menu. (It’s not really needed for vegetarians, since Chuy’s regular menu makes meatless choices clear by marking those items with the icon of a cow with a line drawn through.) However, since some of Chuy’s vegan suggestions are slightly ridiculous (you’ll see what I mean later), I’ll provide some real-world advice. There are several dining rooms and each one is difference. This is the lovely “Palm Room” – a bit more elegant and romantic than the other rooms. This is the main dining room. 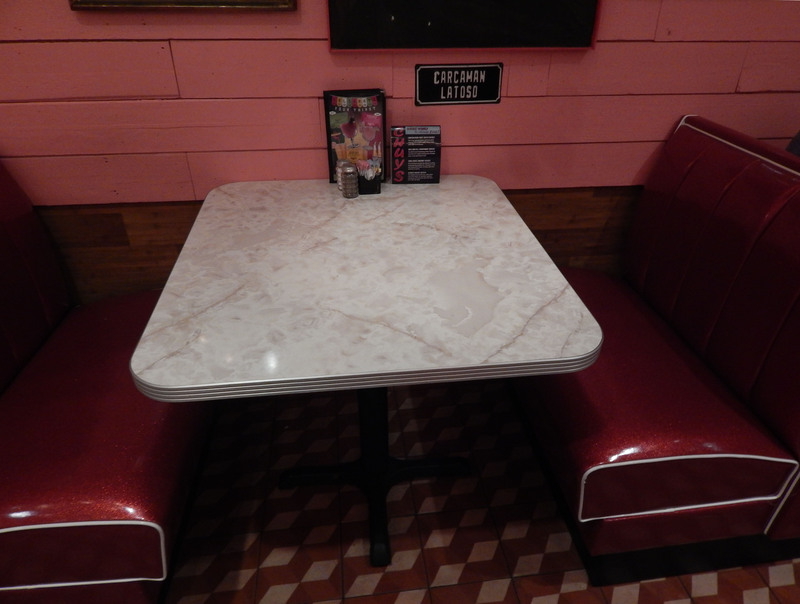 Here Chuy’s seems to be going for a retro Mexican diner look, with diner furniture, red vinyl booths and large photos/paintings of what I can only assume are supposed to be old Mexican film stars or others of note. Your meal begins with complementary Chips and Salsa. The chips are fresh, very light, extra-thin and crispy, and served warm. Absolutely perfect! They are fried in vegetable oil in designated fryers. The house salsa they bring with the chips is vegan. It has a little zing but is still on the mild side, so if you like it hot, order a side of green chilis or jalapenos. If you want an appetizer beyond chips and salsa, Chuy’s also offers Guacamole ($6.29 – no hidden dairy or mayo), Nachos ($6.99 – tortilla chips with refried beans, jalapenos, lettuce, and tomatoes – hold the cheese), and Special Nachos ($8.29 – same as nachos but with guacamole and pico de gallo – again, hold the cheese). 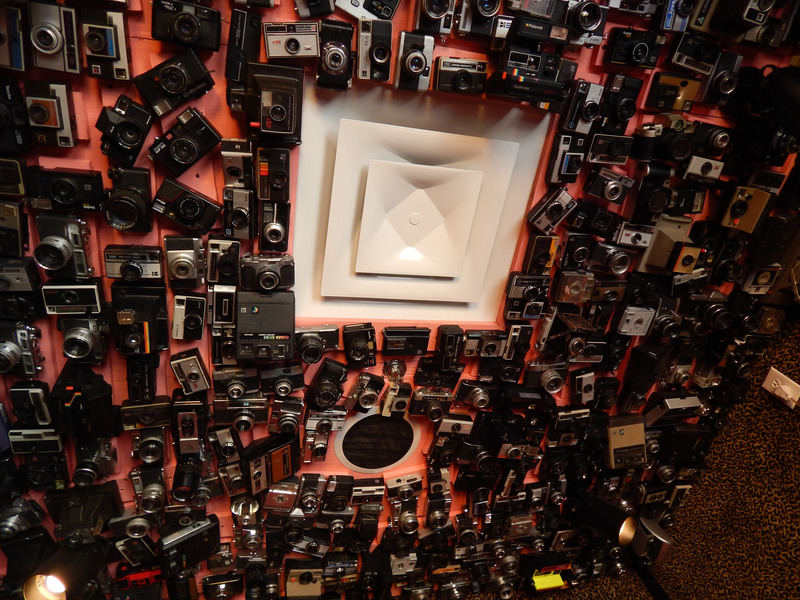 This is where the Chuy’s vegan menu got a little ridiculous. The suggestions? Mexi-Cobb Salad without Chicken or Cheese – Translates to green chilis, tomatoes, and avocados on salad greens ($9.79). If you really want a salad, I would suggest the Large Dinner Salad ($4.99). Tomatoes and cucumber on salad greens – and ask your server to add some avocado or guacamole. Of Chuy’s four salad dressings, only one is vegan – the Cilantro Vinaigrette. Tortillas: All tortillas are made in-house and are vegan (Corn, Blue Corn, Flour, and Whole Wheat). Sauces: Chuy’s has six signature sauces. Two are vegan. Ranchero – fire roasted tomatoes, cilantro, onions, bell peppers, and spices. Tomatillo has fresh green tomatillos, green onions, cilantro, and garlic. Both sauces are mild, so don’t hesitate to ask Chuy’s to kick up the heat with a side of chiles or peppers. Of the other four sauces, Tex-Mex is a meat sauce, Green Chile has chicken stock, Deluxe Tomatillo has sour cream, and Hatch Green Chile has beef stock. Refreshingly, all of the sauces and their ingredients are very clearly listed in a sidebar on the menu. Most of the vegan entree options offered are “bean things.” Bean and Cheese Tacos – without cheese ($8.89). Bean and Cheese Burritos (“Big As Yo’ Head!”) without cheese ($8.59). Bean and Cheese Sopapillas, without cheese (suggested on veg menu, but couldn’t find on regular menu to price). The most exciting vegan option (and my favorite) is the Veggie Enchilada ($8.79). Spinach, onions, zucchini, yellow squash, red bell peppers, serranos, roasted green chilis, and corn in blue corn tortillas topped with Ranchero sauce – hold the cheese! Not only is it something a bit different from all the bean things (I mean, c’mon, I can get bean burritos are Taco Bell, Moe’s, and Chipotle’s), but it’s actually quite tasty and absolutely loaded with fresh veggies. You could also order this with the Tomatillo sauce. Another option I like is the Guacamole Taco – hold the cheese ($8.89). This is actually two soft tacos filled with guacamole and some lettuce. Sounds very uninspiring, I know. But when I added the rice, beans, tomatoes, onions, and jalapenos that came with my order, as well as a little chip salsa, and then rolled it up – I wound up with an extremely tasty rice-and-bean burrito. I’m pretty sure it was yummier than the “Big as Yo’ Head!” version. Your bean options are Charro Beans and Refried Beans. Both are vegan (yay!) Both are made from pinto beans (yay! We have ENOUGH black beans already in Charlotte, thankyouverymuch!) The Charro Beans are supposed to be spicier, but I wouldn’t say either was very spicy. 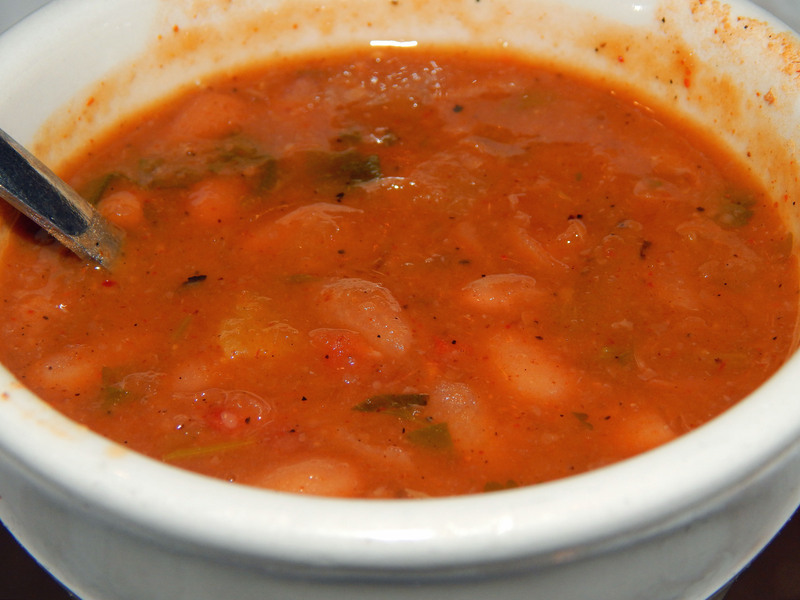 The main difference appears to be that Charro Beans are whole beans, served in a bowl. While the Refried Beans are … well, refried beans. Mushed up. I prefer the Charro Beans with the Veggie Enchilada. And I like to order Refried Beans to add to my Guacamole Taco. 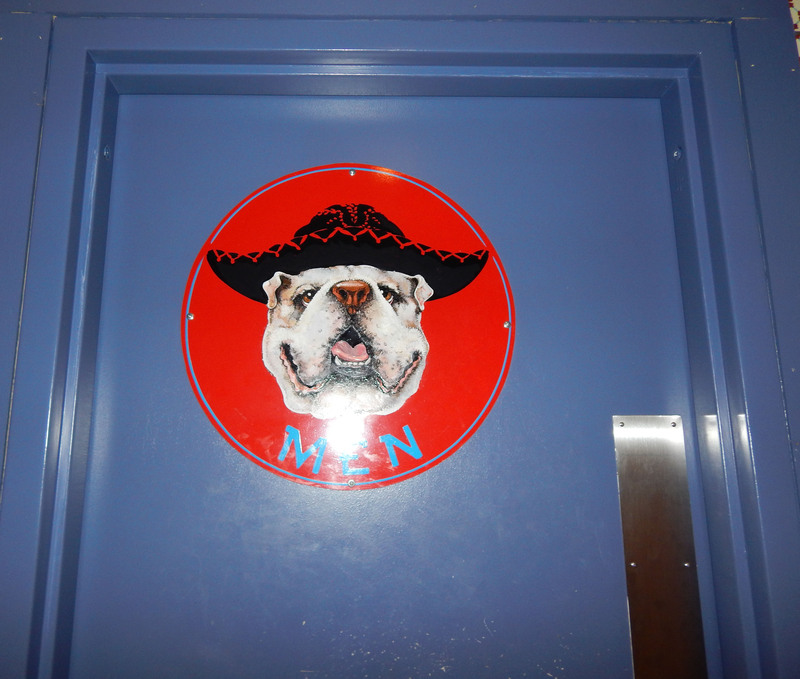 Both rices offered – Mexican Rice and Green Chile Rice – are also vegan. I was told Green Chile is the spicier rice, but again, both options are mostly mild. 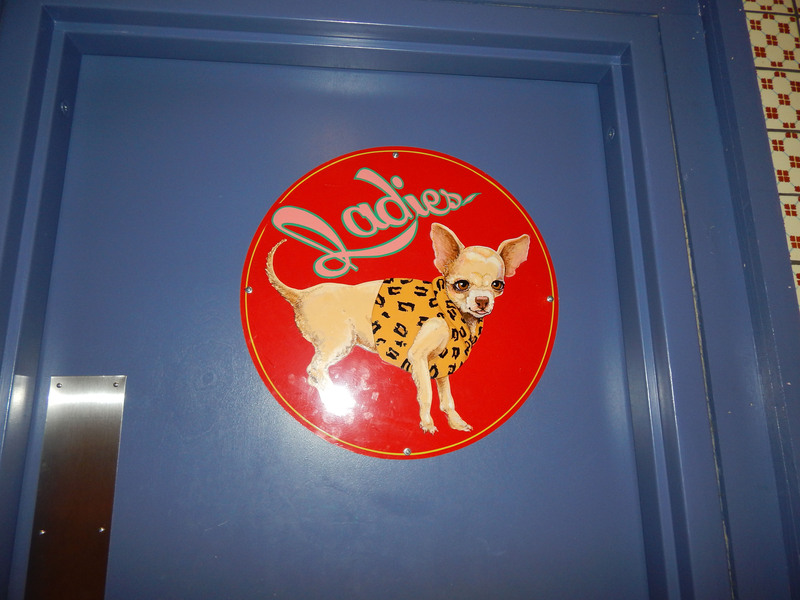 Chuy’s is rumored to have a knockout happy hour (4:00 – 7:00 PM weekdays), complete with a “fully loaded nacho car.” I haven’t experienced happy hour, nor tried any of the drinks, but if you do you’ll be glad to know Chuy’s has large, clean restrooms. 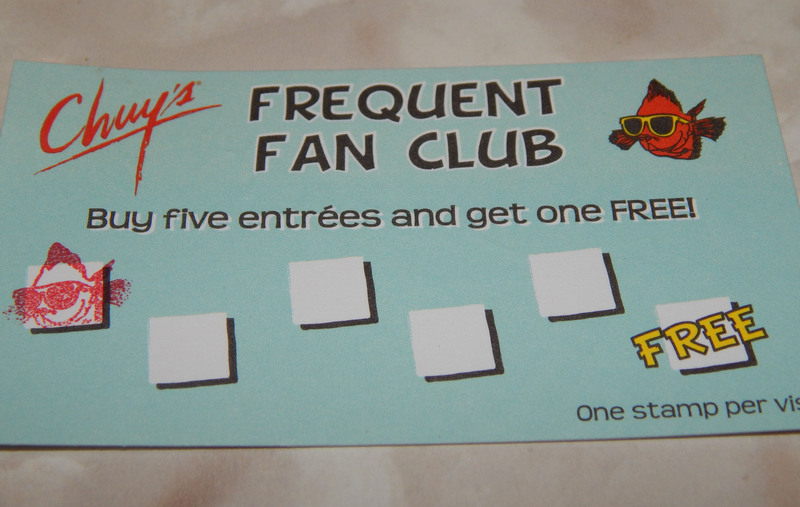 Frugal Vegans: Do not forget to pick up a Frequent Fan Club card … buy five entrees, get the sixth free. Vegan Verdict: I definitely enjoyed the Chuy’s experience! I’d love it if they would add a little vegan variety and concoct at least one vegan sauce with a little more oomph! However, what options they do have are tasty and I can eat with peace of mind. Chuy’s is not going to be my first choice when dining alone or with other vegans, but I will happily dine there with my omnivore and vegetarian friends! A restaurant like this has been much needed in SouthPark. Thank you, Chuy’s. Thanks for the review! I’ve been wanting to try this restaurant out!!! Let me know how you like it! And I can’t wait to hear the results Wednesday!!! Thank you so much Catherine! I appreciate the support you have given me. Hope to see/meet you at VegFest Charlotte!!! Awww, we had a good time there, didn’t we? Is this accurate for the location in Murfreesboro, TN? Hi, Sarah – I am not sure, but this is a chain as opposed to a franchise, so I would assume it would be! The menu looks exactly the same. You can go to their website and click on the “contact us” to verify. They’ve been great at getting back to me when I had questions. Thanks for this, I am on my way to Chuy’s and saw your post while trying to find out the ingredients in the refried beans. I can’t find anything online but will ask at the restaurant. 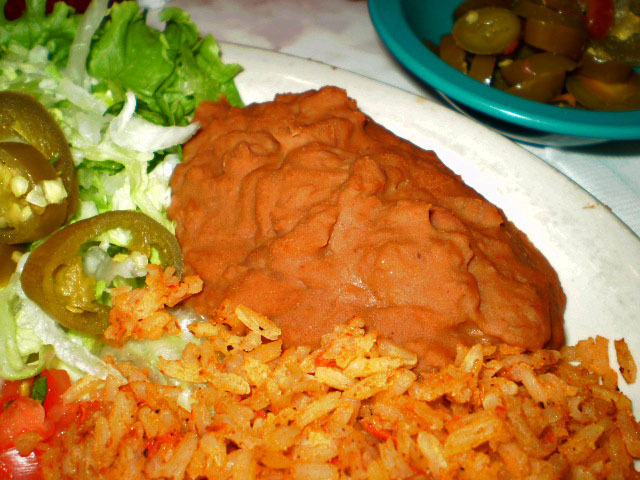 Typically refried beans have chicken broth added for flavor and because liquid is used in making them, maybe they use water or veggie stock. Just want to be sure! Shannon, I also forgot – they used to have a separate vegetarian/vegan menu as well (you had to ask for it, though). Hopefully they still do!